Kids of all ages will enjoy making a sweet DIY Snow Globe Craft to gift or keep this holiday season. They are easy, fun, and perfect for home or school! After printing the template and gathering supplies, invite kids to draw a picture on the snow globe template. Next, invite kids to color in their picture with crayons or oil pastels. Invite kids to paint over their picture with watercolors. When the paint is dry, invite kids to cut out both parts of their snow globe. We used the snow globe base as a template and traced it onto black paper, but kids could also color it in. Glue the snow globe base to the back of the snow globe. Pour 1–2 tablespoons of styrofoam snow onto the middle of the picture. 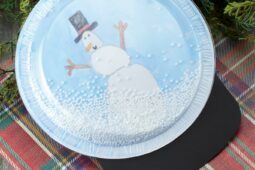 Last, glue the plastic plate to the snowglobe. I recommend leaving the snow globe in place until the glue dries to prevent the styrofoam balls from adhering to the sides of the plate. Your plastic plate snow globe is complete. When the glue is dry, kids will enjoy shaking, twisting, and turning their snow globe! Thank you for visiting Fireflies and Mud Pies!